... from a bygone era. Currently only 8 in stock - will there be more shortly? 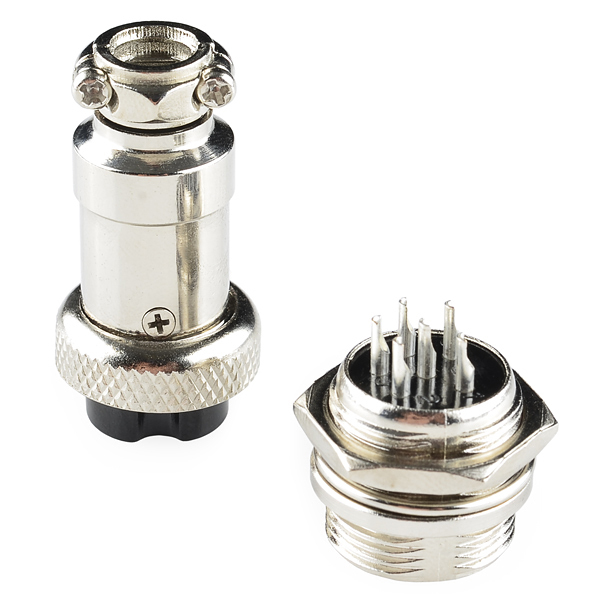 What is the max AWG wire size recommended for these connectors? Unfortunately the data sheet was captured at such low resolution that the dimensions cannot be read. How much current can these handle? They look perfect for connecting my stepper motors to my control box for my CNC router. Not sure if it still matters, but anyone who might be wondering as well, the datasheet appears to show 5A max. I was only able to decipher "electric current" from the row with all 5's. Also, the pin sizes appear to be 1.5mm, the nearest AWG wire size safely allows 4.7A for power transmission, so it seems likely the datasheet is saying 5A. Anyone who can read Chinese might be able to confirm. I would say prob no more than 10A per pin (that is the upper limit that I have pushed the 4 contact variant of that. Note as the pin count increases the diameter of the pins reduces. A general question on a wiring setup with these connectors - if I am connecting to multiple devices (say small motors), where each one needs a V+ and ground (all go to a common ground), is it okay to make one pin on the connector connected to ground and the rest of the pins the V+ output? And then tie all the motor grounds together and go to the ground pin on the connector? Could Sparkfun please provide a datasheet that is written (or at least mostly translated) into English? Specs elsewhere list this as an M16x1 thread on the panel mount side. The clearance hole for this is described on tap charts as 18.0mm or 45/64". The retaining ring (on the connector's panel top side) looks like it's either 18.5mm or 19.0mm, so drilling a 16-17mm may make for a more secure fit. I have these on order and will take calipers to them when they arrive. 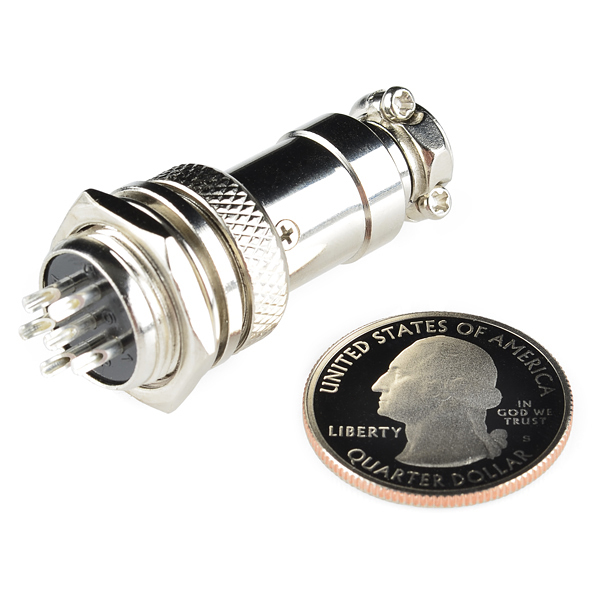 Really basic question--where would one find appropriate wire for this connector? 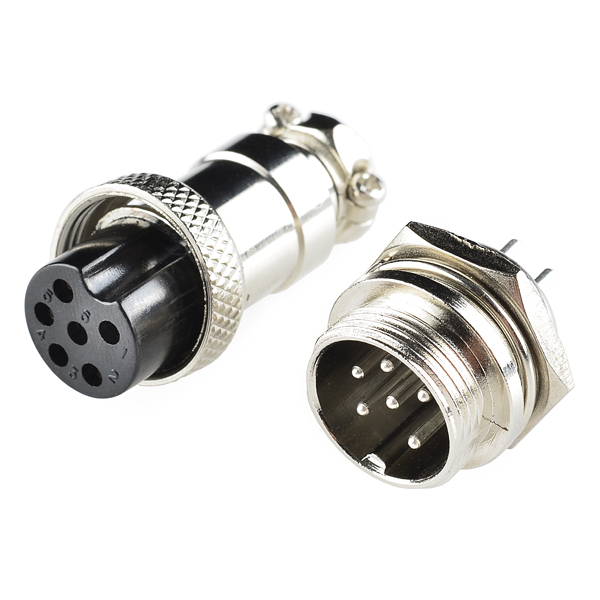 Is it possible to offer these connectors with the genders reversed? 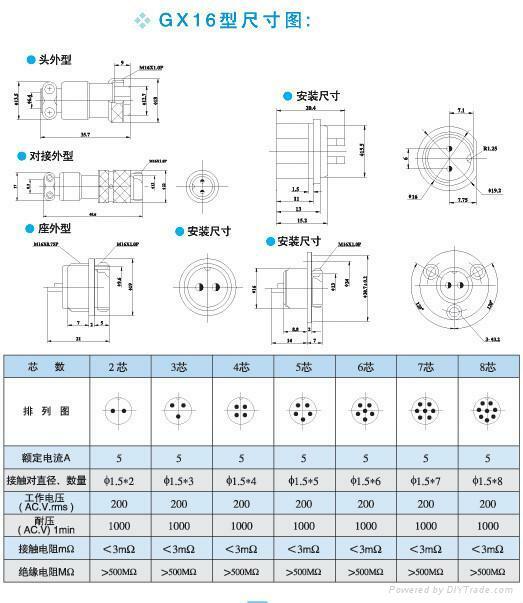 In other words, have the panel mount jack be female and the mating plug be male? Like gdgt mentioned, these look great for connecting stepper motors to a CNC mill control box I'm designing, but I generally prefer to have female jacks on the box and have the plugs be male, like plugging an applicance into 120V wall outlets. Maybe I'm thinking about it wrong, but if I'm powering the steppers with a 28V supply (using a current limiting resistor), I assume the connectors would have 28V on them. Having female pins seems safer to me as there's no male pins sticking out waiting to be shorted to something (or someone, me?) by accident. You're absolutely correct that best engineering practice is to have the "hot" side of a plug on the female / recessed side. These may have been designed to be used as a power input, where the power is coming in on the cable end. We'll look into carrying the opposite version. Thanks for the great feedback! Awesome! How long would it take to see if they're available, and if so how long would it take to get them in the store? I'm almost done with my design and will be ordering parts soon-ish. Was going to use DB9 connectors, but the holes for these would be much easier for me to machine. If it's on the order of weeks, I could probably wait. If it's on the order of months, I might just go with my original idea. Or perhaps just get these for now if they'd be the same size as the reversed gender type. I've looked around the web for the reverse of these, but haven't found the same type of pins and connectors... Thanks for the reply! Product cycles here can take a few months, so it's not likely to happen fast (sorry!). Since you'll (hopefully) never be hot-plugging stepper motors into your controller, these should work fine for your application. That's a good point! Thanks! For what it's worth, this appears to be the exact connector on my Xytronic soldering station. I have a DC digital Hakko soldering iron controller. (This one. http://letsmakerobots.com/node/32675) I would love to mod the board into a project box, looks like I could plug my Hakko iron into one of these for a nice solid connector on the box. These look like a DIN 45322 (60'Deg pin spacing), am I correct? looks like the mic connector used on some ham radios. Aren't these known as 6-pin DIN connectors? (DIN for the German standards body Deutsches Institut fÃ¼r Normung). To my knowledge they are called "Microphone connectors" by some places. Both of my Alinco rigs have connectors simular to these (except its 8 ways), its also used on some CB radios, the old AM CB I have uses a 4 way connector. Are they water proof or water resist? Suitable for outdoor use? I love these connectors, but they're decidedly not even water resistant. Made the mistake of using a pair on my R/C boat - not good. You could probably mod them to be slightly resistant by adding some grease, but I wouldn't go that route unless you really need to. Hey that's a great price on a panel mount microphone jack and plug. 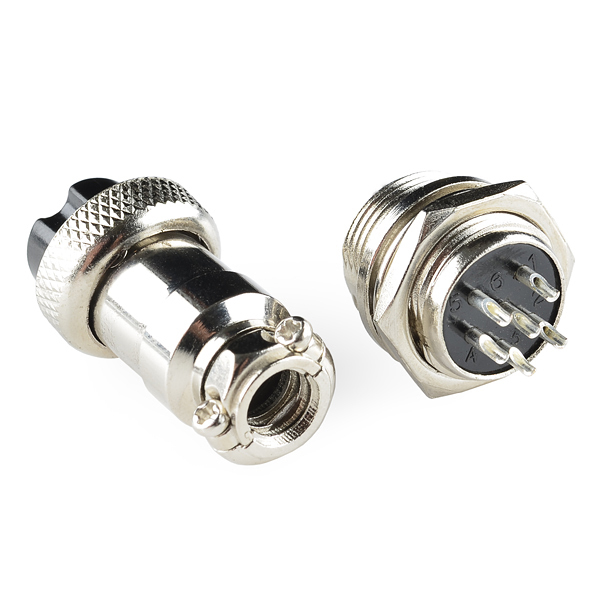 I've been looking for something better than the usual 4 pin connectors for use in an amateur radio transceiver project.